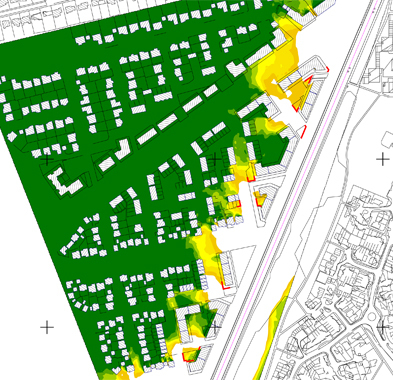 RMP were commissioned to undertake the environmental noise impact assessment for the proposed residential development, including producing the noise chapter for the global Environmental Impact Assessment. Due to the size and location of the site, the assessment considered road and air traffic noise impact by using advanced modelling software SoundPlan to refine the acoustic design for the project by working out the level of noise for each proposed residential building at each floor level, accounting for the noise screening and reflecting from all surrounding buildings. CALA and Barratt David Wilson are proposing a development of approximately 650-700 homes with the provision of Community Facilities, a bus turning circle and 25% onsite affordable housing. The proposal includes for a broad mix of housing types, ranging from 1 Bedroom Apartments to 5 Bedroom Family Homes.